This fantastic, recently renovated apartment is situated in one of the most popular neighbourhoods of Barcelona, the trendy El Raval. One of the city´s main artistic areas, there are plenty of things to do in terms of art galleries and designer boutiques. It is conveniently located just a 10 minute walk from the famous Las Ramblas, and Plaça Catalunya, where there are plenty of superb restaurants and bars. Other parts of the city can be easily accessed by public transport, as there are several metro and bus stops located nearby. The apartment has a double bed and 1 bathroom, allowing up to 2 guests to stay here. The kitchen includes the basic essentials, plus a comfortable living area, balcony and communal terrace where you can relax. This cosy apartment also comes with internet, central heating, heaters and a washing machine making your stay that extra bit easier. Metro Station: Universitat (L1/L2) or Liceu (L3). This apartment is fully managed by AB. This means our team of dedicated professionals handles the cleaning and maintenance of the apartment, as well as your check-in and check-out. You'll have 24 hour service during your stay, including a multilingual representative on hand to help you with anything you may need. El Raval is one of the most multicultural and cosmopolitan neighbourhoods in Barcelona. As the focus of the recent city renewal program in Barcelona, El Raval is quickly becoming the place to be for the latest trends, hippest art scene, and chicest nightlife, and has seen an influx of new residents due to its wide variety of leisure facilities.
. Strolling down the famous Las Ramblas, which separates El Raval from the Gothic Quarter, you will discover some of Barcelona´s biggest attractions such as the Gran Teatre del Liceu, the living statues and the Christopher Columbus Monument. The Raval neighbourhood is one of the city´s main artistic areas and is home to the Barcelona Contemporary Art Museum (MACBA) and the Centre of Contemporary Culture in Barcelona (CCCB), located in the Plaça dels Àngels. Here you will also find some of the best art galleries in Barcelona, designer boutiques and some popular nightclubs.
. El Raval is also is rich with history and amazing architecture. The National Library of Catalonia can be found in the centre of the town, alongside Gaudí´s modernist Palau Güell. There are two major markets in the area: the Mercat de Sant Antoni, where on Sundays you can find a rare collection of old books, coins, records, stamps, and more, and the world-renowned Boqueria Market, where you can buy some of the freshest goods on the Mediterranean coast. While staying here, you could even use the kitchen in your Barcelona apartment to try out some new Spanish recipes with delicious ingredients plucked straight from the market. 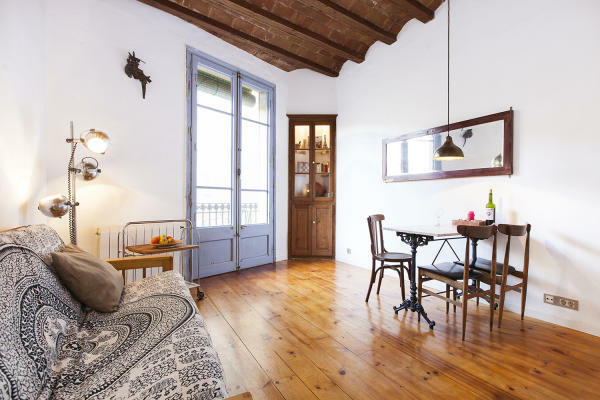 So, if you´re looking to stay in a central location, with some of Barcelona´s best sights, attractions and activities right on your doorstep, then a Ramblas apartment in Raval is the perfect choice.